These articles are simply intended to record the progress of various projects that have been or are being undertaken in the Dales. This project was Work in Progress at the time of Mike Wooding's untimely death on 9th August 2006 in Meregill Skit. It is unlikely that I will make a return to the end, so it is being published now as a record of what was achieved and as a tribute to a wonderful friend and a great caver. 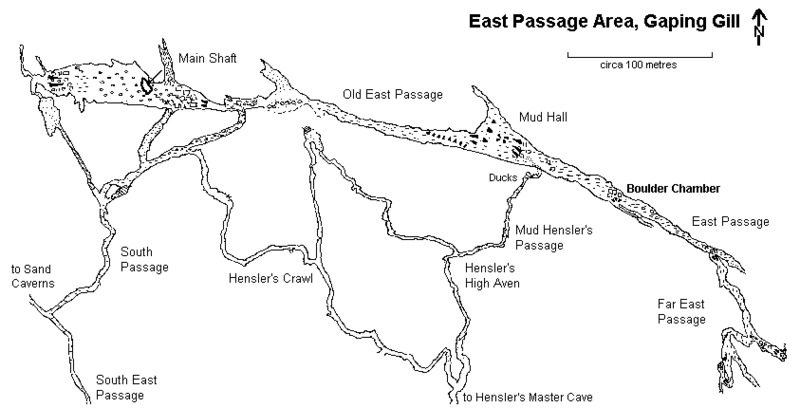 Boulder Chamber is a large breakdown chamber located just beyond Mud Hall in East Passage of Gaping Gill. The way towards Terminal Chamber picks a muddy route round to the left, whereas to the right a sizable stream cascades in from high above to disappear into a crater of clean-washed boulders. A series of loose pitches, appropriately called Avalanche Pot, end in a choke some 50 m below. The inlet above Avalanche Pot was first entered by London University cavers in 1973. The first aven proved to be 23 m high, and led to a succession of further avens ascending to within a few metres of the surface. The final main 30+ m aven had the stream descending, whilst a series of easier and drier pitches ascended at one side. The London University cavers ascended the latter to a draughting calcite choke. A brief description and a cross-section (with confusing discrepancies between the two!) was published in the first BCRA Bulletin with the promise that a full account and survey would be published in a later LUCC Journal. This never appeared, but Dave Brook has recently managed to unearth a copy of the plan from his files. Following the winding down of the Small Mammal Pot project, and Mike's year-long rebolting of Rat Hole, John and Mike started to think about whether Avalanche Pot Inlet should be re-investigated. It was established from John Cordingley that he had successfully dye-tested the source of the water from an immature sink in the stream bed some 15 m above Grange Rigg, and from Ged Benn that the lower parts of the inlet were in the same fault as the lower part of the BPC Klondike Dig. Comparison of the shale bands on the LUCC cross-section and those shown on the LUSS Bar Pot s urvey indicate that the top of the inlet reaches to within about 12 to 14 m of the top of the drift, which implies a lot less than that if the passages make their way under the Grange Rigg valley. The prospect of yet another entrance into the Gaping Gill system was sufficiently enticing for the two to investigate further. This document records work undertaken by Mike Wooding (MJW) and John Gardner (JWG) in 2005 and 2006. Note, that the fixed ropes left in as a result of these explorations are all new (2005) Lanex 10.5 mm, and that the bolts are 10 mm by 60 mm sleeve anchors. The ropes currently in Shark's Tooth Aven and the 33 m aven are temporary, although the bolts are permanent. MJW and JWG: After Mike had given John a guided tour of the new and very impressive route down Rat Hole, the two made their way to Boulder Chamber to take a look at the prospect of re-climbing the first aven of Avalanche Inlet. Here they found what appeared to be LUCC's original 80' rope still hanging down from above. The rope looked like black kernmantle, but John Cordingley later said that it used to be white! MJW and JWG: Dihedral was descended on this occasion, being deemed to be the quickest and most energy-efficient route to the Main Chamber. Once in Boulder Chamber, Mike did a bounce test on the rope hanging down the first pitch, before tentatively making his way up it. Near the top, it emerged from a tight rift at the east end of the aven, but he managed to establish that the tightest section could be avoided by a snug ascending traverse to the west, followed by a horizontal traverse back through a bottomless keyhole passage to the belay of the original rope. This proved to have been a Y-hang from two rawl bolts, and was pretty substantial. Mike placed four new bolts - one back in the passage at the top of the pitch, one at the end of the keyhole passage traverse, and a Y-hang below the original tight section. A 30 m rope was then installed, which proved to be just about the right length. MJW and JWG: Being drill-less, it was decided just to make a further reconnaissance of the inlet, entering the system through Bar Pot. The passage at the top the first pitch in Avalanche Inlet was negotiated to the base of the very impressive Rainbow Aven which boasts one of the finest display of cave pearls in the Dales, and is located on an impressive fault. An old scaling pole with a thick coating of calcite was stretched across the chamber. After conducting a suitably energetic appropriate bounce test on the 33-year old rope Mike ascended, to find that the belays at the top were in need of replacement. He then pushed on as far as the attractive Sugar Candy Palace before returning. The passage below Rainbow Aven was draughting inwards. Conditions were wet. Practically all the water enters Rainbow Aven from a rift in the eastern extension of the fault. The fault at floor level in Rainbow Aven has a down throw to the south of over two metres at the eastern end but only a metre of so at the western end. From below, it was evident that the aven went above the level that Mike had reached. The old rope was also dropped from the first aven. The trip took a little under four hours. MJW and JWG: The main purpose of the day was to start work on Shark's Tooth Aven at the end of Avalanche Inlet, and Bar Pot was descended armed with ropes, a drill, and bolts. The way on from the beautiful Sugar Candy Palace turned out to be a seven metre climb at the far end, which led into a meandering traverse in a high rift, which in places was constricted and tortuous. The 3 m climb into the base of the end chamber was overcome by combined tactics, and a bolt and a temporary rope placed for SRT access. The chamber is not large, but the main aven soars impressively upwards for about 30 m, and was liberally sprinkled with spray (surface conditions were fairly dry), and had a healthy draught. In a shallow alcove to the right of the main shaft is the base of the series of pitches ascended by LUCC known as Shark's Tooth Aven, and above the entry passage a third, dry, aven appears to ascend in stages. No ropes had been left in situ in the LUCC aven, and the muddy walls and lack of holds repulsed attempts to free-climb it,so it was decided to return with spits. The ropes were left. On return, some tight traversing and the awkward climb back into Sugar Candy Palace were avoided by traversing at roof level to a point where a temporary SRT rope was hung from a couple of newly-placed bolt into the centre of the chamber below. A little time was then spent by Mike investigating the continuation of Rainbow Aven. By traversing out, and looking up he saw a splendid display of pure white curtains round the rim of the aven, and that the continuation went on up another 7 or 8 m to a flat roof, and appeared accessible. He inserted a bolt, and the two made their way back to the surface after a seven hour trip. MJW and JWG: The plan for the day was to bolt up the first pitch in Shark's Tooth Aven, and also to replace the 9 mm ropes on the small pitches above Rainbow Aven and that on the bottom pitch with 10.5 mm Lanex. It was not the best day to go. JWG had been to a party the night before and really wasn't to be trusted underground, and a long cold spell had broken the night before (John Cordingley said later that 22 mm of rain had fallen), and the caves were very, very wet. A descent was made of Bar Pot, and steady but damp progress was made, replacing the ropes on the two small pitches en route, to be eventually confronted by a very hostile end chamber. A sizable stream was coming down the main aven accompanied by a veritable gale making the bottom spray-lashed and very cold. There was also a fair amount of water coming down the side aven. Mike gritted his teeth and girded his loins, and one hour and six bolts later he had reached the top of the first section as planned. An attempt to replace the rope on the bottom pitch failed for want of a spanner, and so the new rope was left stashed at the top. The surface was reached after a 6½ hour trip. MJW and JWG: Conditions were too wet for a serious onslaught on Shark's Tooth Aven, so it was decided to have an easy trip tidying up. Steady progress was made to Boulder Chamber, and whilst JWG went off to visit Terminal Chamber at the end of Far East, MJW went up the pitch to Rainbow Aven. There he collected the LUCC rope that had previously been dropped, and also picked up a rusty LUCC electron ladder, before making his way to the head of the first pitch taking, some bearings as he did so. Finally, he re-rigged this with the 10.5 mm Lanex, allowing the 9mm rope to be retrieved. Meanwhile JWG had packed up the original LUCC rope that had been hanging down the bottom pitch, and the two staggered back to Bar wondering what had happened to the easy trip. MJW and JWG: Today was intended to see another onslaught on Shark's Tooth Aven, but JWG had spent the previous night suffering from a migraine, so cried off. Rather than waste the day, MJW took the required gear as far as Boulder Chamber so as to make the next trip easier. He also brought out the old LUCC ladder from the bottom of Bar Pot where it had been stashed. MJW and JWG: Without much gear to carry the journey to Boulder Chamber seemed a lot easier, and Shark's Tooth Aven was reached in a little under 2½ hours. Although half an inch of rain had the fallen the night before and whilst the place was wet and draughty, it was not as overtly hostile as on the previous visit. MJW ascended the first pitch, removing the bolts as he did so, and rigged it for SRT allowing JWG to follow. The pitch lands on a scoop, with the floor rising in a blind rift straight ahead, and the main aven going straight up for about 8 m. The aven is named after is a large flake at the head of the pitch. The rift connecting this subsidiary aven from the main aven pinched out, although there was a narrow window through right at the very top, which may prove to be negotiable. MJW started to bolt directly up, and after seven bolts he was was able to bridge across and reach the entrance of the passage which traversed over the rift below. This meant that a good SRT hang was found which landed at the back of the scoop, and JWG ascended. The rock at the top was very rotten, which has led to the creation of some interesting rock architecture. After a few metres the passage could be seen to continue at the top of a short climb. The gear was left stashed at the top, and the return commenced, with Mike derigging the bolt climb. At the bottom of Shark's Tooth Aven, the dry aven above the point of entry was briefly inspected, and it seemed as if it may provide a civilised way into the main aven. The surface was reached after 7h 20m. MJW and JWG: This was the first visit for a couple of months owing to Mike's time being taken up in preparation for the Fellsman, and to an inclement late May. As this was the BPC winch meet, Bar Pot was already rigged, and the end was reached in a little over two hours. Shark's Tooth Aven was ascended to the bottom of the top pitch. In theory, this was free-climable, but with the absence of protection and the remoteness of the location, discretion was deemed to be the better part of valour, and Mike climbed it with three bolts. At the top a crawl through a tight and sharp rift led to an impressive pot, which leads through an impenetrable rift to the base of the pitch. A loose and awkward traverse over the pot led to an equally loose climb and tight passage. Things didn't look promising, so a retreat was made, with a hanger being left at the top and the remaining two bolts capped. Attention was then turned to the window through to the main aven at the top of the second pitch in the side aven. Mike traversed across to it, passing the skeleton of a bat en route, and managed to wedge himself whilst placing a bolt in the main aven. He then squeezed out into the aven, at an estimated height of 22 m, to find himself right in the path of the water. Fortunately, it was a dry day and barely a dribble was coming down. Three further bolts were placed, reaching a height of about 28 m, before a halt was called to proceedings. The roof is about four metres above, but as yet, no passage can be seen, and the remainder of the climb looks a little awkward owing to a glut of thin shale bands. On the opposite side of the main aven, the dry aven disappears behind a flake at about 30 m height. A descent back via the window into the side aven proved too challenging for comfort, and so a descent was made to the end of the climbing rope about four metres above the floor, and a transfer made to the rope on the first pitch in the side aven which JWG pulled over. Well over 3½ hours had been spent at the end, so a retreat was made via Bar Pot, with envious sidelong glances being cast in the direction of the people being winched up the main shaft as the Main Chamber was passed. The surface was reached after eight hours underground. MJW and JWG: Bodies weren't fully recovered from the last trip, but the good weather had held, and Mike was keen to finish the bolting so that the drill could be retrieved. A descent was made of Bar Pot laden with a 40 m rope, a battery, and some more bolting gear, and Shark's Tooth Aven was reached after 2½ hours. It then took a further hour to gather together the gear from various level, and for Mike to kit up. Mike then ascended the main aven from the bottom and continued bolting. After 2 m of closely spaced shale bands, the rock improved, and he was able to move left, away from the line of the water. The angle then eased into a slight scoop. The upper part of the shaft tapered in, with the very top divided by a rock pendant. The caverns immeasureless at the top proved to be a bedding 13 cm high and 1 m wide. On the opposite side of shaft, a small dry aven disappeared under a rock flake, but appeared to pinch out at the same roof height. Lower down, the main dry aven went up behind a rock bridge, and the upper reaches couldn't be seen. The fresh 40 rope was rigged from the top from a permanent bolt. Two metres or so lower down, on the left, is an enlarged bedding, the lower edge forming a slight prow. A rebelay here using two 10 mm bolts gave a fine free hang to the base of the shaft. On descent, derigging the ascent bolts and rope from the opposite side of the shaft proved to be 'interesting'. Six 8 mm anchors were used, with a total of 10 from the window, together with three 10 mm anchors. The shaft was about 33 m high. In the meantime, John who had been sheltering from falling debris up by the Shark's Tooth, capped the bolts on the bottom pitch of the side aven, and most of the ones on the second pitch. Another four caps are required to complete the job. A despondent return was made to Bar with the drill and the 30 m climbing rope. Things perked up in South Passage, however, when young Irish ladies were encountered around every corner and at the top and bottom of every pitch. We weren't too proud to accept their help with the tackle... The exit was reached after a total of nine hours underground. Following a pointer by John Cordingley, MJW and JWG started to dig in a shakehole some 30 m west of Grange Rigg in August 2006. This was taken over by the Craven Pothole Club (although they have a slightly different take on the history!) and named Clod Dyke. CPC reached bedrock in August 2007 after about three metres of glacial fill to expose an immature bedding taking water. This was smell-tested to the top of the end 33 m pitch. The dig was abandoned and back-filled in February 2008. This appears to have blocked the passage to Avalanche Pot Inlet which is now largely dry. Bradford Pothole Club have radio-located the end of Avalanche Pot Inlet at the "top of the last rope", to SD 75442 72614 at a depth of 15 m. It is not known whether the location was from the top of the 33 m aven or from the bottom of the last pitch in Shark's Tooth Aven. Either way, the top passage in Shark's Tooth Inlet reaches a lot closer to Clod Dyke. Page last updated: Monday 28 January 2019 .